I would like to seek your guidance on what kind of Nutrition Surveillance System can be established to monitor the NS of children and other vulnerable groups (e.g. pregnant and lactating women) during the onset of El Nino? What kind of Assessment/baseline information needs to be established? I would appreciate if you can provide some materials that I can refer to. (f) Clear pathways to decision makers and agencies in order to facilitate rapid response when needed. By repeated small sample cross-sectional surveys in a small number of sentinel communities selected by CSAS or another spatially stratified method. The sample would be of children ages 6-24 months (most at risk) and their mothers. I'd use an open cohort approach as this make best use of the sample size by reducing between rounds sampling variation. I'd use a bayesian normal-normal PROBIT estimator to estimate prevalence as this makes very good use of a small sample. I'd also pick apart the DDS to look at key nutrients. This is very similar to the HUMS / LP (HUnger Monitoring System / Listening Posts) method used by SC and ACF. There is a bundle of material here (c. 40MB) that you may find useful. Alongside this I would do market price monitoring of staple goods. I'd start this ASAP as the utility of a surveillance system usually increases with longevity. Taking into consideration that is should be low cost and simple. (1) Make a list of all villages in the area. (2) Sort this list by municipality. (3) Decide on the size (m) of the first stage sample (see below). This type of sample exploits "implicit stratification" which tends to spread the sample properly among important sub-groups of the population such as rural / urban / peri-urban populations, administrative areas, ethnic sub-populations, religious sub-populations, and socio-economic groups. This often improves the precision of estimates made from survey data. The use of implicit stratification improves the efficiency of a two-stage cluster sample and allows us to use relatively small sample sizes compared (e.g.) to SMART surveys. I would use a map-segment-sample approach to taking the within community sample. 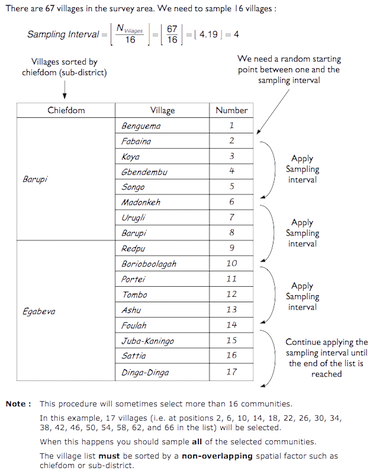 The simplest approach is to divide the village into four approximately equal sections and take one quarter of the overall village sample from each section. This also brings implicit stratification. I would analyse teh data using either means of MUAC (or using the PROBIT method to convert this to a proportion). I would use a normal-normal Bayesian analysis with an objective prior (as in LP / HUMS). This makes best use of the sample. Now to sample size. I do not think that for a wide area you should have fewer than m = 16 villages. If you can afford and sustain a larger first stage sample then you should take one. An overall sample size of n > 192 should be sufficient when using the normal-normal Bayesian analysis with an objective prior. A sample size of m = 16 and n = 12 from each community would be best. If you think that an open cohort is difficult then take a new sample each time. I would sample children aged 6-24 months as this is probably the most at-risk group and likely to respond quickly to a shock. Note : This is not a PPS sample so you may want to produce a weighted analysis (i.e. results weighted by the populations of each village). This is not hard to do. Here is a worked example for a proportions. A similar approach is use for means (you only change the way the overall variance is calculated). Thank you very much Mark! I really appreciate it. I've just read through this exchange and am happy that Mark has been promptly providing support and advice. I'm coming into the discussion just to offer help to Derich. I am guessing that this setting is in the Philippines and I would be interested in helping in my own personal capacity. I have experience implementing something similar to what Mark has described here and have a bit of experience with the indicators he has mentioned and the sampling approaches discussed. If you would like any further help and specific support in designing your planned surveillance, feel free to contact me directly on email and we can even arrange a call and can walk you through all the details and help with implementation. I am hoping some previous experience with the Philippines context and experience with the approaches that Mark has suggested / advised will be helpful. Please let me know and I would be more than happy to help and support as much as needed and required. We have recently established sentinel sites based nutrition surveillance system in Afghanistan for PND and we have used the CDC calculator for sample size calculation ‘sample size calculator for two surveys with multiple outcomes’. You could also try it and see if it works for you. Thanks Shafiq. I will look into this.